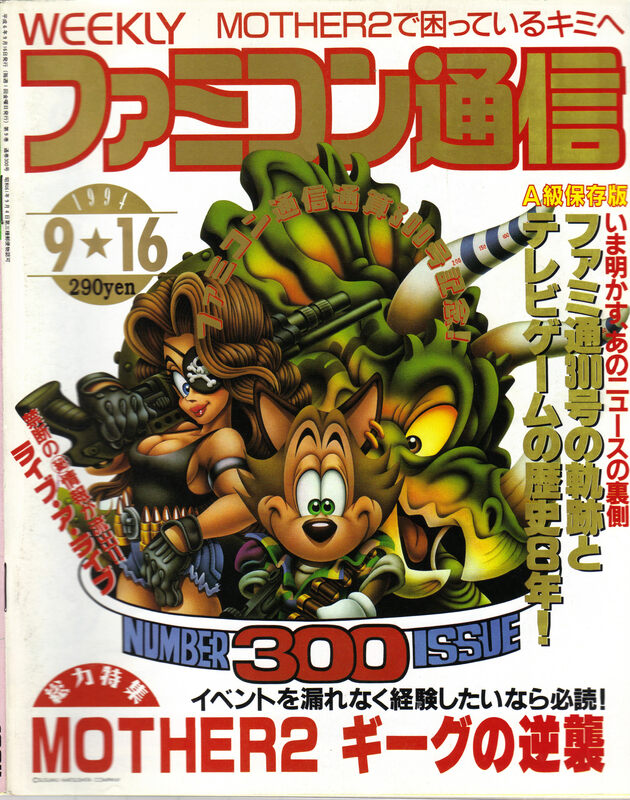 Weekly Famitsu – September 16, 1994 | Yomuka! This week’s issue covers the MOTHER 2 Pre-release Party attended by all staff involved in the game. This time the article is not an interview, but a description of the event. A pre-release party for MOTHER 2 took place on August 24 in a hotel in downtown Tokyo. This, of course, was to celebrate the August 27th release of MOTHER 2: Giygas Strikes Back. Those involved with the production of MOTHER 2, including the scenario director, copywriter Shigesato Itoi, gathered at the hotel for the event. Itoi was the first to speak. In front of the production staff of 40 he said, “Sorry for the wait, everyone. People have said a lot of things to me over the past five years, but the delay is all the staff’s fault. (laughs) Please show your appreciation today for all their hard work.” His speech was both funny and heartfelt. Next was Nintendo’s Shigeru Miyamoto, who holds the title of MOTHER 2 supervisor. The party was a standing dinner, so there was a friendly atmosphere the entire time. All kinds of people surrounded Itoi that night–even Chunsoft president Koichi Nakamura went to offer him some congratulatory words. In any case, MOTHER 2 is finally on store shelves. Itoi should be breathing a sigh of relief right about now! Shigesato Itoi talks about the joy of finishing MOTHER 2. Must have been one difficulty after the next. HAL Laboratory President Satoru Iwata attended as the Programming Director. He commented that the staff kept a good attitude as production went on. Shigeru Miyamoto from Nintendo was a supervisor this time around. Much like a remote control, he provided lots of advice to the production staff. Itoi's wife Kanako Higuchi joined in as well. She stood out from the crowd as much as you'd expect. We're curious about their conversation that night. Wonder if she's played MOTHER 2? Even Koichi Nakamura had a chat with Itoi. Maybe they'll be rivals in seeing which becomes more popular: MOTHER 2 or Kamaitachi no Yoru. Miyamoto and Higuchi right after taking a commemorative photo together. Miyamoto looks so bashful. Clay figurines of the MOTHER 2 characters were on display in one corner of the room. It seems the team really enjoyed producing the game if they took it so far as to make these. Everyone in this picture had some kind of role developing MOTHER 2. It was a fairly big crowd of various people from Nintendo, APE, and HAL Laboratory. Seeing as it was immediately before the release of the game, there were plenty of attendees seeing the game for the first time at the venue. Photographic evidence that the official M2 clay figures probably smell of stinky cigarette smoke. Thanks for posting these! Ahahaha, sommmmebody sells things on eeeBaaay! Dungeon man’s dad!!!!!!!!! My favorite!!!!! Thanks, as always, for translating Chewy. I love reading these! Hi! I’m going to be receiving the magazine that lady is holding, in a few months. I know there is a Mother 2 advertisement in it, but I don’t know much else about it. Is there any other significance that I should know about? Thanks!